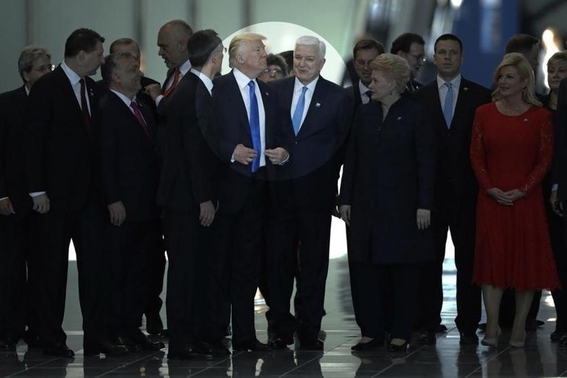 Prime Minister Dusko Markovic of Montenegro (center right) smiled after President Trump appeared to shove him aside during a 2017 NATO summit in Brussels. FOR MORE THAN two years President Trump has made it clear that he begrudges America's commitment to NATO. But his disdain for America's preeminent alliance hit a dangerous new low last week. In a Fox News interview with Tucker Carlson shortly after his press conference with Vladimir Putin in Helsinki, Trump was asked why the United States would ever want to come to the defense of Montenegro, a tiny Balkan nation that became a member of the alliance in 2017. 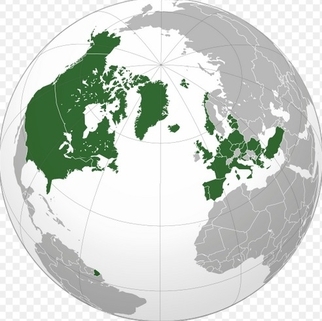 NATO is a mutual-defense organization, Carlson noted, and its core principle, enshrined in Article V of the North Atlantic Treaty, is that an attack on any one of its members will be treated as an attack on all. "So let's say Montenegro, which joined last year, is attacked. Why should my son go to Montenegro to defend it from attack?" There were any number of good responses Trump could have given. He could have reminded Carlson that history's most ghastly wars began because the West failed to deter malevolent aggressors against small countries like Montenegro. He could have pointed out that though Montenegro joined NATO ally just 13 months ago — with the backing of the Trump administration — it has already deployed troops to Afghanistan to serve alongside the United States in the struggle against the Taliban. He could have argued that the wider the circle of nations bound by NATO's guarantee of collective defense, the lower the risk that any American will ever have to go to war for Montenegro. Trump didn't say any of that. Instead he embraced the premise of Carlson's question, suggesting that no good can come of having Montenegro as an ally. "I understand what you're saying," the president said. "I've asked the same question. Montenegro is a tiny country with very strong people. . . . They're very aggressive people. They may get aggressive and — congratulations, you're in World War III." It was a terrible answer. At the most obvious level, Trump misstated how NATO's mutual-defense pledge works. Article V of the NATO treaty doesn't require allies to fight if Montenegro decides to "get aggressive" and start a war. It comes into force only if one of the allies is attacked. Montenegrins may be "very strong people," but NATO does not empower them to trigger World War III. For 70 years, the NATO has deterred Russian aggression against its members in Europe and North America. In reality, Montenegro is a very weak country, not a strong one. As John Schindler, a former National Security Agency analyst, writes in The Spectator, "its military has fewer than 2,000 troops, its army is a single light infantry battalion lacking armor or modern artillery, and its 'air force' is a squadron of aging helicopters." Montenegro isn't going to attack anyone. But without NATO, Montenegro might well be attacked. That is precisely why the most dangerous nation in Europe — Putin's Russia — went to such extremes to prevent its accession to the alliance. To sabotage Montenegro's bid to enter NATO, Russia attempted to overthrow its pro-Western government and assassinate its prime minister. Fortunately the plot was foiled, and Montenegro was welcomed into NATO. It is now safe inside the world's most powerful military alliance. If Russia menaces Montenegro again, it will potentially face not just those 2,000 lightly armed troops, but the combined might of Europe and North America. But that is only true so long as Article V's assurances remain ironclad. And each time Trump hints at misgivings about defending a "tiny" NATO ally, he erodes the deterrence that is at the very heart of the alliance. For 70 years, the Atlantic Alliance has deterred Russian aggression against its members. It's no wonder so many of the Soviet Union's former captive nations were eager to join NATO after the fall of the Iron Curtain. They were under no illusions about the harm an undeterred Moscow could lead to. In 1938, as Hitler set his sights on Czechoslovakia, Neville Chamberlain said it was unthinkable that Britons should risk war "because of a quarrel in a far-away country between people of whom we know nothing." If Trump studied history, he wouldn't complain that Montenegro is a "a tiny country" with which America shouldn't have to concern itself. Russia's president certainly knows better. America's president should too.